Hey everyone, hope you’ve all had a great Monday so far. 🙂 I’m back with a spotlight on a title that sounds damned interesting! If I didn’t have so much on my plate at the moment (all the books I’ve already received for review, writing up reviews of the books I’ve finished, and gearing up for the final edits of my own novel before its April release) I’d definitely be reading this novel. Marcus Antonius Primus began a golden age for humanity when he liberated Roma from Octavian Caesar and became sole Consul. With wisdom from the gods, future Antonii Consuls conquered the world and spawned an interstellar civilization. Three weeks before the millennial anniversary of the Antonii Ascension, star freighter captain Kaeso Aemelius, a blacklisted security agent from Roman rival world Libertus, is asked by his former commanders to help a high-ranking Roman official defect. Kaeso misses his lone wolf espionage days – and its freedom from responsibility for a crew – so he sees the mission as a way back into the spy business. Kaeso sells it to his crew of outcasts as a quick, lucrative contract…without explaining his plan to abandon them for his old job. But Kaeso soon learns the defector’s terrifying secret, one that proves the last thousand years of history was built on a lie. Can Kaeso protect his crew from Roman and Liberti forces, who would lay waste to entire worlds to stop them from revealing the civilization-shattering truth? First, I want to thank Dave-Brendon for giving me space on his blog to explain the “big idea” behind my latest novel. Much appreciated! 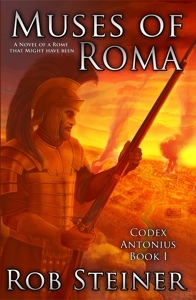 So you typically don’t see “Roman Empire” and “space opera” in the same sentence, but that was the unlikely combination that inspired MUSES OF ROMA, my new sci-fi/alt-history novel about a Rome that spawned an interstellar civilization. When Dave-Brendon asked me to write about where I got the idea to combine the two, I realized the idea had not come to me fully formed, but had evolved over many years. Short answer: Harry Turtledove. And the Muppets. The first alternate history novel I read was GUNS OF THE SOUTH by Harry Turtledove. It was a great story, but what I remember most was the cover. It had a photo of General Robert E. Lee from an old history book, all faded and yellowed. But in his hands was an AK-47. It was such a subtle, yet jarring cover that I had to buy the book to find out how Robert E. Lee ended up holding a weapon that wouldn’t be invented until 100 years or so after his death. Fast forward to 2009. While thinking up ideas for my fourth novel, I glanced at my bookshelf for inspiration, noticed GUNS OF THE SOUTH, and recalled how I’d always wanted to write a book with a similarly jarring cover. Alternate history it is, I thought. The who came quickly: I’ve always been an ancient Rome geek, with numerous non-fiction books on Rome sharing shelf space with my favorite novels. In keeping with my desire for a jarring cover, I thought, How aboutMark Antony holding a musket? I liked it. But something was still missing; I wanted to do an alt-history book, but not a conventional one. So I sat on the idea for a few days. I jokingly thought, Maybe I’ll do Romans…in spaaaace! I’m certainly not the first author to combine science fiction and alternate history. Again, Harry Turtledove did it with his four-book Worldwar series, where aliens invaded Earth at the height of World War II. Even GUNS OF THE SOUTH had sci-fi elements. But I was hard pressed to find any Roman sci-fi/alt-history, or more specifically Roman space opera/alt-history. I’m sure it’s out there, but the point is that I at least had an idea that hadn’t been done to death. I did a lot of brainstorming over the next year on where we are and how we got there.How did the Romans establish interstellar colonies? What was the one event in Roman history that diverged from our timeline and enabled such an outlandish, science-fictional situation to occur? I wanted that “terrifying secret” to be the core of my novel. Once I had settled on the “terrifying secret,”I began to fill in the nooks and crannies of the alternate universe as my unlikely heroes fought to survive. How did Roman culture evolve because of this secret?What were the implications on Rome’s future if the secret were revealed? I used many resources on ancient Rome to get the subtleties of Roman culture as right as I could. You can find the Prologue and Chapter 1on my web site. I do hope you have as much fun reading the novel as I did writing it.